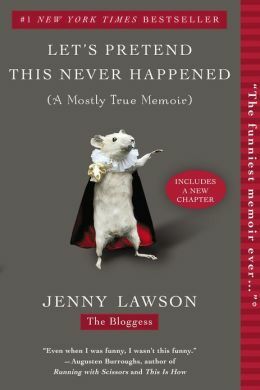 Perhaps the best indicator of whether you’ll enjoy this memoir by Jenny Lawson (aka The Bloggess) is whether you enjoy reading her blog. If you find her blog funny, you’ll find the book funny. If you find her blog overly coarse or just plain weird, this may not be the book for you. If you’ve never read her blog at all, then the best suggestion I can give is for you to go check it out. In fact, allow me to direct you to her post about Beyonce the Giant Metal Chicken, a post which became one of the last chapters in this book. 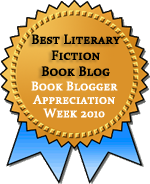 I’ve been reading The Bloggess intermittently for the last couple of years. I’d call myself a fan, but not a hard-core fan. I have to be in the right mood to find her funny, and when I’m in that mood, I will laugh and laugh at her writing until my stomach hurts and I’ve shaken lose whatever has been clogging my sinuses that day. So I made sure to read this memoir when I was in the right mood for it, and I ended up enjoying it very much. And as a semi-regular reader of Lawson’s blog, I was delighted to find that most of the book was entirely new-t0-me content. Personally, I didn’t find anything in here to be particularly offended about, although I know others who would. One of the things I like about Lawson’s writing is that, as coarse as it sometimes is, it’s not mean-spirited or cruel. When she makes fun of her sister for being so popular that she could get away with wearing a ridiculous school mascot costume in high school, you can tell that her comments come from a place of affection, rather than of bitterness. But her writing is coarse and filled with references to vaginas and diarrhea and dead animals, so it’s clearly not for everyone. Lawson grew up in rural Texas, in a home that didn’t have reliable running water but that did have raccoons living in the bathtub wearing tiny little jams. Her family also had a gun cabinet, which apparently astonishes people who don’t live in the South: “They get hung up on the fact that we had furniture devoted to just guns, but in rural Texas pretty much everyone has a gun cabinet. Unless they’re gay. Then they have gun armoires.” It took me by surprise that people get hung up on the gun cabinet thing, but I grew up in the South. Not everyone in rural Virginia has a gun cabinet, but lots of people there hunt, and lots of hunters keep their hunting rifles in a locked gun cabinet. We had one at our house because my brother used to hunt. It’s amazing that things that seem perfectly ordinary to one person can be totally bizarre to another–and that’s kind of what this book is about, finding the bizarre in the ordinary and the ordinary in the bizarre. Really, whether something is bizarre or ordinary all depends on your perspective. Lawson goes on to tell of her meeting and eventual marriage to her husband Victor and the birth of her daughter Hailey. She hits all the usual notes you expect in a memoir. A lot of the book is made up of funny anecdotes, like her purchase of Jean-Louis the alligator and the subsequent plane journey, but she also talks about her struggles with rheumatoid arthritis, her generalized anxiety disorder, and her miscarriages. So it’s not all wacky hijinks. This is a book about life and all its many bumps and detours. The last part of the book feels less like a memoir and more like a collection of essays. I would have liked a little more filling in of gaps, particularly when it comes to her decision to start blogging and how that tied into her decision to leave her job in HR and start writing full-time. She mentions her blog a few times, and there’s a lovely chapter about finally being able to feel comfortable with other women that she met through her blog, but there’s nothing on how she went from not blogging to being a blogging star. I’m not looking for a how-to on that, but the lack of a story here seems like a pretty big omission. Aside from that, I was happy to get the stories she chose to share, and I’ll continue to enjoy more on her blog for (I hope) years to come. When the metal chicken blog post got so famous I read it and was turned off by what seemed to me to be inconspicuous consumption–a woman who thinks nothing of buying new towels and doesn’t think anything of paying a hundred dollars for a metal chicken except that she could have bought something else? Not someone whose perspective I’m going to have an easy time with. Perhaps I was approaching the way she writes too earnestly, or perhaps–the gun cabinet thing seems to support this–she makes a lot of assumptions about her audience, and that narrows the possibilities for who can enjoy what she writes. See, the way I think about that chicken story is as an example of how we all (or most of us anyway) do things that are mysteries to other people, including how we spend money. And then sometimes you end up in a marriage with someone who sees spending priorities completely different from the way you do. I’d never spend $100 on a giant chicken, but I’d spend it on a really good play, which someone else might see as over the top. Lawson does a lot of things that don’t really make sense on their face, but so do we all. I like the way she takes joy in the silly things she does and uses them to bring joy to other people. As for the gun cabinet thing, I thought the way she handled it was pretty clever. It wouldn’t have occurred to me that it needed explaining, but she managed to explain it while also making a point about cultural differences. But you’re right–the appeal of her writing is going to be limited. That’s true of most writers, I would think. I think I’ll skip the book, but I’ll check out the blog. THanks. The blog is definitely the place to start. I will say, however, that the books gives context to some of my favorite posts (like the one on Beyoncé) that make them a whole lot more sympathetic and understandable than they might appear on first glance. That’s a good point about the context. I was glad to get some context about her taxidermy collection, especially her rules about what she will and won’t buy. After checking out the blog, I’ve added this straight to my wishlist. She sounds a bit like a US equivalent of Caitlin Moran in the UK. I’ve only read Moran’s How to Be a Woman, but I can see some similarities, especially in the willingness to be a little crass when it’s called for. I think, in general, Lawson’s writing is a little lighter and sillier, but that’s just my impression for the specific works I’ve read. I know one reason I don’t read her blog more regularly is that when I’m in the mood for her writing, I want to read a bunch of it, so I save it up for when I’m ready. I probably check in on her blog once every month or so and read a bunch of posts all at once. And now you’ve got me curious about your not so nice reasons. Lack of editing in a blog? Potential NSFW content in your Internet history? Yeah, I don’t generally read the comments there because they’re not really conversations so much as repeated “that’s hilarious” comments. For me, the chicken story (which made laugh so hard I cried) isn’t about the chicken or its cost. It’s about marriage, that imperfect relationship you have with the person you love the most. I read her blog very rarely, but I enjoyed the book. Your recommendation to take a look at the blog first is a good one; she’s not for everyone. That’s a good way of looking at that stories. I think that’s what a lot of her stories about her little spats with Victor are about. There’s something light and warm about those stories that makes me feel like there’s a lot of love at the heart of them. I’m really grateful for this review – Lawson’s memoir has been on my wish list for a while, but I’ve never been sure if I would like it. Now I’ll try the blog and find out. I see now that she has a very particular sense of humour! Her humor definitely doesn’t appeal to everyone, which is one reason it’s nice to have the blog as a sampler. I read her blog, but wasn’t able to make it through the book. Partly it’s because I was listening to the audio and wasn’t crazy about her voice, but I also think I just prefer her in small doses rather than a whole lot all at once. I do appreciate her sense of humor though!